This is it! The twice-delayed, much-anticipated, and another of the Bartolini Crown Jewels, my family’s risotto recipe. Though it’s been a long time coming, I think you’ll find it appealing, even if it is unlike most that you may know. You see, the Bartolini risotto is missing a couple of the dish’s standard ingredients and includes one that most do not — but we’ll discuss that in a bit. Our risotto had quite a reputation among the branches of my family that did not reside in the two-flat. When our relatives from Cincinnati, at the time the southernmost members of the Clan, came for a visit, they had a standing request that this risotto be served as part of their welcoming dinner. I remember Mom making it for Dad’s Mother during her visits with us and risotto was often served when either of the two-flat’s families entertained. 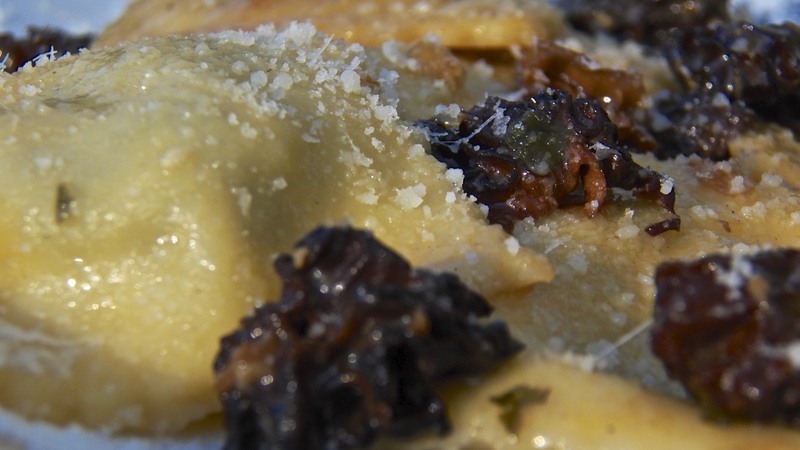 What made the Bartolini risotto so special? Chicken gizzards, an ingredient that was lacking from almost all other risotto recipes. 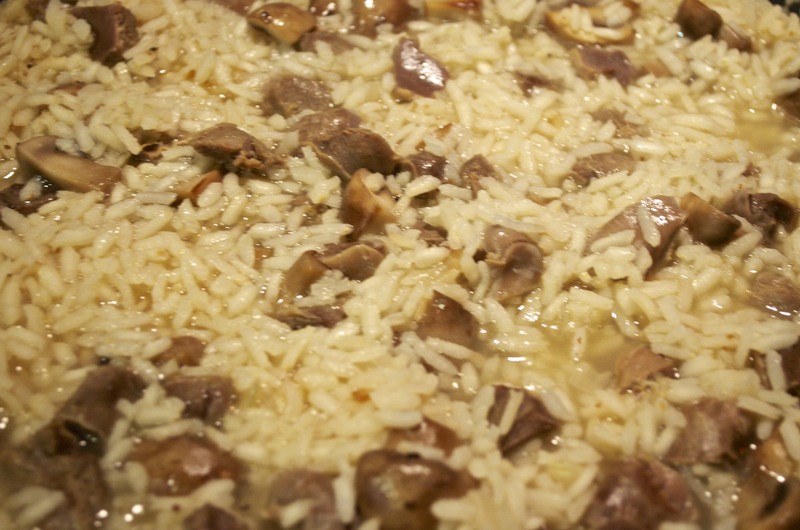 If you liked gizzards, you loved this risotto. Of course, if you didn’t, well, you’d probably go hungry that night. The latter point being responsible for the greatest cover-up in the long and storied history of the Bartolini. Now, there’s nothing so unusual about what Mom did. After all, Mothers since the dawn of time have cajoled, bribed, and, yes, lied to their children, all in the name of good nutrition. (How many broccoli crowns have been hidden in meatloaf throughout the millennia?) No, the truly surprising thing about this tale is how long the ruse lasted. We had all gathered at my Parent’s home for a family dinner, an event that had become more and more rare. When “It” noticed that Mom was preparing risotto, “It” asked Mom if dried mushrooms were to be included. Hearing that, I started to laugh and, much to Mom’s dismay, the cover-up was exposed. The astonishing fact is that the child was now in “Its” 30s! That’s right: 30’s! One “Or else!” from Mom and my sibling and I kept quiet for 3 decades. Kids today have it easy. Our risotto is a bit more complicated than most. The gizzards, after all, must be cooked first. To do this, they are sautéed before being used to create a stock. As you’ll see in the recipe below, both the gizzards and the stock are then used to create the risotto. You’ll also note that 2 cups of Arborio rice are used. This will make a rather large platter of risotto. You may wish to reduce the amounts. Add the butter and olive oil to a saucepan over medium heat. Add the cleaned chicken gizzards to the pot and sauté for about 10 minutes. The object is to give them a bit of color, not fry them till fully cooked. Turn the heat to high before adding the onion, celery, carrot, and 2 quarts of water. Bring to a boil and reduce to a soft simmer. Continue to simmer for 90 minutes, removing any foam that may rise to the top. After 90 minutes, strain and reserve the stock. Remove the gizzards and set aside to cool. Remove the vegetables and discard. Once cooled to touch, chop the gizzards to your preference. In a large sauce pan or deep frying pan, melt the butter over med-high heat. Add the onion and sauté for about 5 minutes. Season with salt and pepper. Add the mushrooms and sauté for a few minutes until some color is achieved. Add the gizzards and sauté until heated through. The onion should be translucent by this time. Season with salt and pepper. Reduce the heat to medium, add a ladle or 2 of hot stock, and stir the rice. Though you needn’t stir it constantly, you shouldn’t leave it for more than a couple of minutes. Add a handful or 2 of grated Pecorino Romano cheese, stir to combine, and place on the serving platter. In many versions of risotto, white wine and saffron are added to the rice, although neither are used in my family’s risotto recipe. At a later date, I will post a recipe for Risotto alla Milanese, in which both ingredients are required. In my area, chicken gizzards are sold in 1 lb packages. Before cooking, they must be rinsed and trimmed of any fatty and/or dark parts. Try to keep the fleshy parts as intact as possible. These will be chopped once cooked. If you’re trying to “disguise” the gizzards, it’s best to chop the mushrooms in about the same size as the chopped gizzards, keeping in mind that the mushrooms will shrink when cooked. The standard ratio of rice to stock when making risotto is about 1 to 3½, meaning for every cup of rice you’ll need 3½ cups of stock. It never hurts to have extra stock on hand just in case more is needed to cook the risotto. The stock created with the chicken gizzards is relatively simple, with the few ingredients left in large pieces. This makes it far easier to retrieve the gizzards once cooked. When ready to start cooking your risotto, combine the stock made when cooking the gizzards with enough homemade chicken stock to give you the amount required in the recipe. Of course, store-bought, low-sodium, chicken stock may be substituted. Keep the stock hot but not boiling. If kept boiling, much of it will immediately evaporate upon hitting the hot risotto pan without having a chance to be absorbed by the rice. It’s déjà vu all over again … It’s that time of the year again. In this part of the country, every grocery, market, and vegetable stand features at least one bin filled to over-flowing with ears of fresh corn. If you’re at all like me you just cannot get enough of the stuff. That’s all well and good for now, but what are you going to do come Fall when today’s surplus is but a memory? Well, with today’s blast from the past, you’ll be laughing all the way to the pantry. 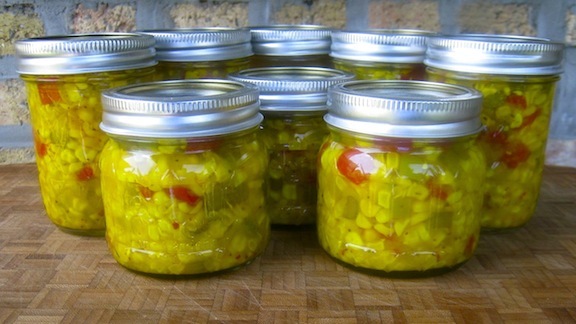 Zia’s Corn Relish is a great way to preserve today’s corn for tomorrow’s meals. It’s a simple recipe and you can find it by clicking HERE. This entry was posted in Family Recipes, Pasta/Rice/Soups (Primi Piatti) and tagged Cooking, family recipes, Food, Italian, Recipes by ChgoJohn. Bookmark the permalink. John dearHeart: bad luck for you ’cause I was just going ‘offline’ when your delightful post came in! Uhuh: I have a large package of chicken gizzards in the fridge, so, guess what? Today Wednesday here: so guess when, as friends troop in for the weekend 🙂 ! BUT there will be some wine in the mix and I shall use a slightly less soft risotto rice!! Should be delightful !!! Well, I for one do love your risotto recipe, will make it and clap 🙂 ! I’m really glad to read that you’re planning to prepare our risotto, Eha. I only hope you enjoy it as much as we all do and make it again and again. My goal is to preserve the family recipes and see them prepared. You’re helping me reach that goal. Thank you, Eha! I thought your wife ate little meat and didn’t realize she gave it up entirely. Being a little older than my sibling when the great cover up was begun, you’d have to be one heckuva salesman to sneak gizzards by her. It’s just not worth it. Happy wife, happy life. Non ho ancora avuto modo di leggere la tua storia (rimedierò magari in questi giorni di ferie) però mi fa piacere sapere che la tua famiglia custodisce ancora strette le tradizioni culinarie del nostro straordinario paese! Ciao, Silvia. Mi dispiace ma non parlo molto bene l’italiano. Yes, the women in our family home all cooked our food in the traditional Italian style. Although my Mother and Zia were born here, they had some very good teachers and were taught all of the “old ways.” In this blog, I’m trying to record the recipes for future members of my family or else they will be lost. Grazie per i complimenti. Buona notte. What a lovely story and recipe. My grandma taught me to boil and rinse the gizzards twice before continuing to cook them. I think your method keeps more of their flavor. Though I don’t cook gizzards too often (your sibling is one of many who don’t like them…), I will definitely give this a try. Your poor sibling! Your mom’s tactics to get kids to eat sound a lot like my own mom’s, though. What was worse in our house though, or funny now that I think about it, was when my mom would use made up words for things that we didn’t know were made up at the time. One example was for a common hair band. My mother always called them “strippers” because when she was growing up this was the brand name of the ones they used to buy. As a 7 or 8 year old I didn’t know that this common household hair accessory wasn’t called this by everyone else, so you can imagine my surprise when I was at school and casually asked one of my girl friends for an extra stripper! I have never made a risotto. I know, I know! I have eaten lots of it though – okay so that doesn’t count. You are just gonna have to add this to the ever growing list for when I come and visit John. I have just added another case of wine to my list. This is what I should have done with my mushrooms last night! Which is why when shopping this morning, I picked up some more. I love your recipes, John. Thank you so much. It’s always an honor to see my family’s recipes so well-received and used. Buon appetito! Oh wow! I remember having to chop up the gizzards and hearts (ick) for the thanksgiving dressing when I was a kid. Haven’t had either in a long long time. Gizzards I’ll go – will take a pass on the hearts. Funny you mention the hearts. They once were always included but there weren’t any in the last 2 packages of gizzards that I bought.Where did they all go? 60 Minutes should investigate. What a great story! 🙂 and isn’t it so true that mothers use serious measures that their offspring have nutritious food! We rarely have chicken gizzards but sometimes when we do we will have to try you risotto! My father had his special way of cooking gizzards, as a youngster I did eat it but as an adult its not something I would purchase and cook. When I make your risotto it will be gizzard free, sorry about messing with your family recipe. Great post John,I can from here smell the parfum of the mushroom and the rice very Passion! men!! Since I purchased the 500g of porcini………risotto has featured often……..always think of you when I make it. 500 g of porcini? How I envy you! Last Spring, I was on a porcini hunt but seemed to get to each store just as the last had been sold. I’ll do better next Spring! It makes me smile to know that you think of me when you prepare risootto. Thank you. Your story of “it” brings back some memories of my own siblings growing up. And of course I have hidden certain ingredients from my own children! I’m glad my post brought good memories to mind for you. It’s a harmless “lie” but your children are healthier today because of it. I have never eaten a gizzard…my husband loves them, the hearts too! can i make it without! can I sub the dried mushrooms…lol….great recipe and story John…. What a wonderful addition to risotto – I’ll have to try that! Mmmmmmmm….risotto! And this one has ingredients that are right up my alley too. Thanks John! This is one of my favorite dishes to make too. Yum!! I’m glad you enjoy the recipe. I’m sure you already make a great risotto and would love to hear how you would modify this one to suit your own tastes. Ah, another gizzard aficionado! They are good, aren’t they? I’m really glad you enjoyed the post and hope you’ll give our risotto recipe a try. You’re going to love it! It is a great dish, isn’t it? I hope you had a great meal. My mom would fry chicken gizzards and hearts — poor farm life — which I ate because I was delighted we weren’t having liver and onions (ugh, the horror). Oh the things mom’s do and the ‘stories’ we tell our kids to get them to eat what we are putting on the table. What a great story, John, and I’m sure your mom didn’t have to twist your arm too much to keep the secret from your sibling — I’m sure was the fun of knowing and watching them eat it! Or at least that’s the way we could be. Looking forward to your morel mushroom sauce — oh the love of those mushrooms! This is a treasure for sure! Love your story too. 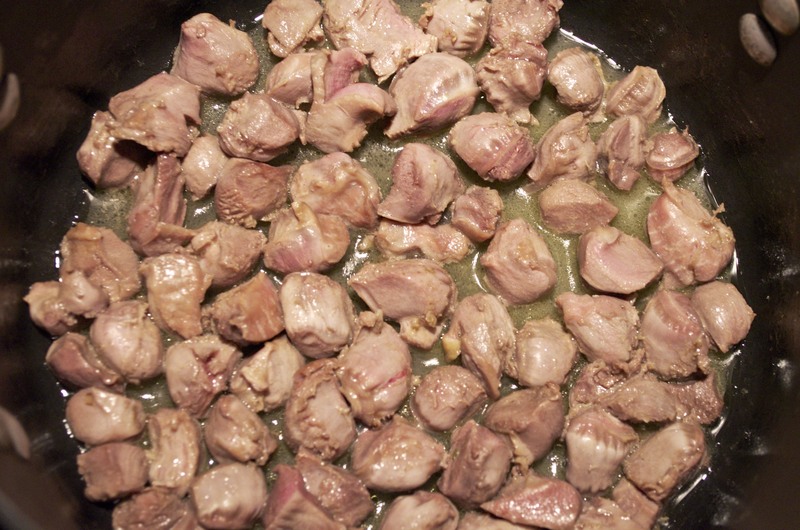 My mom prepared gizzards quite often when I was a child, and I like them. Haven’t had them in years and would be willing to just to make this risotto. Good information here about cooking risotto too..didn’t know the stock water should only be hot without boiling…makes perfect sense. take a look and tell me what you think. The spring vegetable risotto was pretty good…but this chicken meatball recipe was excellent. Gizzards? I had no idea! My MIL taught me how to make risotto – and knowing my distain for onions, chopped up peeled green apple, and now I add apple to my risotto to this day. Here is my spring time risotto – so good! I just checked out your recipe and it sounds great. I really am going to give it a shot. Never have I heard of adding apples and cannot wait to try it. Loved this little story John, especially the fact that you had clan in my neck of the woods!! I have never made risotto. I admit, I’m unsure how I feel about the gizzards, I’m not sure I’ve had them in anything? But my mom was definetly the kind to sneak them in without telling me. What a delish post all the way through. Fall is on the way, and this risotto will grace our table. I, as a Mom, have used “the ruse” as well. A Mom’s gotta do what a Mom’s gotta do. And then I also learned to change the names of a dish to bring back the dragging feet to the dinner table when the kids were tired of “that old recipe”. I renamed a frequently made ground meat dish “Cowboy Meat” and there was a stampede to the table. A shout of “Cowboy meal” would have gotten my Brother & I to the table really quickly! Good call, Mom. I really never had much problem with the dishes my Mom served. My siblings, though, were a different story. Mom tried every trick in the book with them. Some worked and others didn’t. Either way, Mom didn’t cook special dinners for any of us. Either you ate what was served or you left the table hungry. Luckily, there were side dishes to help the recalcitrant one get through the dinner. Loved your story, as always! We had an “It” in our famiy. My twin brother & I would eat anything ’cause we knew we’d be sitting there staring at what we hadn’t eaten for a long, long time while our parents “held out”…. “You can leave the table when you’ve finished your dinner”. “It” found a great solution – when he headed out of the room after the meal, he’d deposit his beets etc. in a very large floor vase !! My mother found out – after awhile – when everything in there began to mold and stink! Three decades! I’m amazed during all that time “It” didn’t wander into the kitchen while your mom was making risotto. And I’m also amazed “It” didn’t smell the gizzards cooking! When did you break it to “It” that there was no Santa Claus? 😉 Really great story. 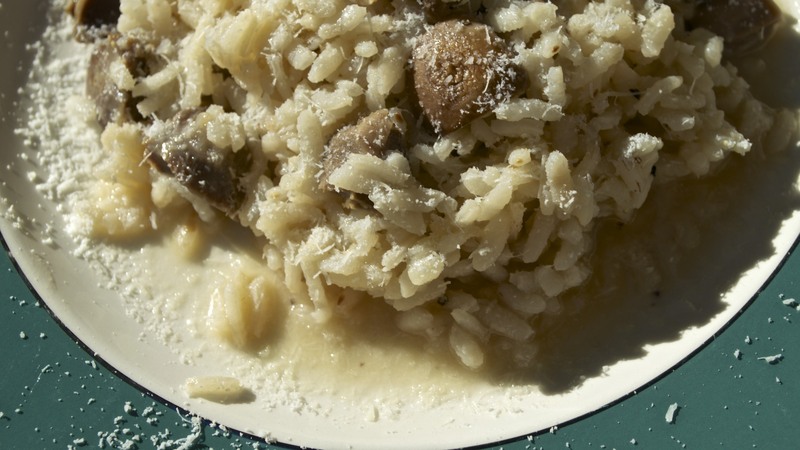 And really great recipe, too – such a nice tasting risotto. Love that top picture, BTW. But I’m a sucker for overhead shots. And I’m looking forward to next week’s recipe – I do a lot with mushroom sauces and pasta. Great post – thanks. Great story John, Your mum must have been a formidable woman. Three decades keeping a secret is good going. I am intrigued by the addition of gizzards to the rice. I suspect both my adult daughters would turn their pert noses up at it. Sage advice John, sage advice indeed. I eat a lot of chicken gizzards and hearts grilled at Japanese restaurants and I LOVE those! I have never had them in risotto dishes and I’m intrigued! It must bring out a ton of flavor. Outstanding dish John, thank you for sharing it with us. Moms are such wily creatures!! Sounds like a fine dish, gizzards or no gizzards. Now that I’m back from the summer trip I can tell you that despite limited and/or poor internet connections over most of the 5 weeks I continued to enjoy your every post, picture, anecdote and recipe. As always! Now at least I can begin to catch up with saying hello and commenting on occasion. Thanks for keeping up the grand task!! John, let me know when you would like me to visit an try out some of your family recipes because I am always available for some great Italian food :). Hi John, thanks for sharing another family classic — both a classic recipe and a classic story! I don’t know about those gizzards, but I guess I’ll have to try them at least once… I like the idea of cooking the gizzards and making stock at the same time. The white wine in risotto is not only for taste but also for texture — the acid in the wine helps to keep the rice al dente if I remember correctly. I didn’t know that about the wine’s effect on the rice. I’d only heard it explained for the flavor aspect. You taught me something here. Thanks, Stefan. Isn’t that the way it always happens? When you want something, it vanishes from the shelves. Better luck next time! This week the gizzards were available and today I made Risotto alla Bartolini 🙂 It turned out great and Kees liked it too. The gizzards were fine, so I’ll use them more often. Post to follow. I’ve made a lot of risotto and I’ve eaten lots of parts of a chicken, but never the gizzards or heart. (that I know of!) But I know if you make risotto this way, it has to be terrific! What a great story and one we can all relate to since we’ve all experienced that certain motherly creativity where children and eating are concerned. But I think this must be a new record! I think most Mothers have done it at least once and there’s nothing wrong with it. Your kids need good nutrition. That’s the bottom line. You obviously did something right, Charlie. You’re kids are all as healthy as an be. I think, above all else, that “It”, too, was amazed that no one had said anything for so long. I still laugh when I think of it, though not around “It”. No sense rubbing it in. This is a very tasty risotto, Charlie. The stock made from the gizzards brings a lot of flavor to the final dish. I hope you’ll make and like it. That looks wonderfully rich. Katherine keeps telling me to get some gizzards because you use them so well! Now THAT is funny! What sweet satisfaction it must have given you to watch “it” eat chicken gizzards for 30 years. Ha! So when the ruse was up and “it” discovered “it” had been eating the the whole time…did “it” come around and decide that they liked the risotto and would eat it anyway? I happen to adore chicken gizzards and I have a long time love affair going with chicken livers too. So I know for a fact that I would love your family’s risotto! I don’t know why I don’t make risotto more often, I’ve only made it once! Your story about special family requests brought back wonderful memories of my grandma’s dinner table. She loved me and spoiled me and always made my favorites. I miss her so! Grandma’s are the best! With that good of an example, I’m sure, April, when the time comes, you’ll be a great Grandma, too. “It” never did eat any gizzards. “It” thought they were dried mushrooms and moved them to the side of the plate. Had “It” learned they were gizzards, “It” never would have touched the risotto at all. Still, “It” was very surprised to learn the truth. Too funny! I eat anything with mushrooms-so I guess that means I eat anything with gizzards. My dad loves gizzards. He used to get an order of fried gizzards to go with his fried chicken! A perfect heirloom recipe. Another very entertaining story about the Bartolinis. Risotto with chicken and mushrooms sounds so good! Great story about the mushrooms! This risotto recipe sounds absolutely marvelous. Even though I’ve just finished dinner, I could really go for some of this risotto right now! I chuckled all the way through reading thinking of how much trouble your mother went to enlist you all in the big ruse! I also liked the “it” component…keeping the peace in the anonymity! I know that same conflict! Well, I’m torn here. I don’t know if I can “go” for the gizzards and hearts. I’ve never had them, so I shouldn’t automatically rule them out, and I love risotto. How about an extra pound of the mushrooms? I don’t know, Debra. Mom didn’t so much “enlist” us as she did “draft” us. We didn’t have much choice in the matter. 🙂 You needn’t use gizzards and hearts if you don’t wish to. This can easily be made without them and the more mushrooms the merrier. Down the road, I intend to post another recipe, Risotto alla Milanese, that I bet will be more to your liking. What great story. Your family are champions not only at cooking but at cover ups. I’ll remember this if I ever need an alibi 🙂 I would eat the Bartolini Family Risotto if someone else made it for me – it looks SO delicious, but I could not handle preparing chicken gizzards… it took me half my life to even be able to handle raw chicken, and for a while I used rubber gloves. However the G.O. will not eat rice in savoury dishes, so I make risotto with risoni, which he will eat. It is a good dish, no matter the recipe, isn’t it? I love it. I love risotto so much but have never thought to try the gizzards in there. It’s definitely something I’m going to give a try although w/my family I will have to go with the mushroom ploy. Little do they know that I’ve been putting the gizzards & liver in my chicken stuffing forever & they rave about that stuffing (although of course they HATE liver & wouldn’t think of eating a gizzard). I’m just wondering though – have you told “It” that he’s adopted yet & was dropped on the doorstep by a band of passing gypsies? Siblings…my older sister used to tell me that I was adopted (only blonde & blue eyed one from parents with black hair & brown eyes). I’d get even every now & then by screaming from another room that my sister was hitting me hehehe…of course she wasn’t within 10 feet of me, but still I know she wanted to hit me. Thanks, Kristy. It is amazing that “the lie” stuck for 30 years. I’m sure Mom never intended for it to go on as it did but at what point do you let the cat out of the bag, or, do you just keep the lie going, hoping the truth is never told? Too funny! Thank you. Since posting the recipe, I’ve heard from a few who know of similar risotto recipes. I, for one, never knew others existed that used gizzards. That’s very kind of you to reblog our recipe. My Zia will be thrilled! Thank you. LOVE the story John. I’m the same way with my youngest who hates fruit but he loves a curried shrimp dish with a mango chutney dipping sauce. He has no idea it’s mangoes! Thanks, Mary Frances. What Moms won’t do to get their kids to eat healthy food! Good for you! We grew up eating the gizzards, heart, liver etc of the holiday turkeys — my husband gets disgusted at the thought of it! I will tell him next time they are simply different varieties of mushrooms, ha! There is a lot of ‘or elsing’ going on in our family too John. I’ve been known to make the silent throat-slicing finger gesture to my eldest son, through gritted teeth, silently imploring him not to divulge certain hidden ingredients to the youngest son (usually aubergine and bell pepper). 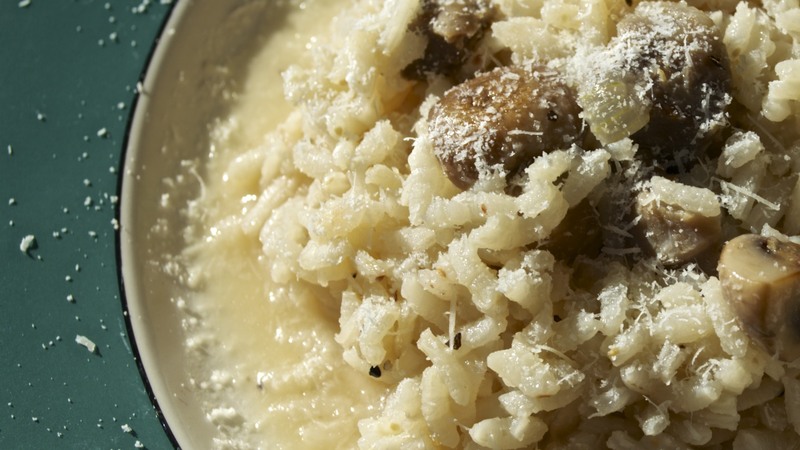 Your risotto looks rich and delicious – especially with that sprinkle of Pecorino – one of my favourite cheese – on top)! I love, love chicken gizzards, the only problem is I can’t remember when I last ate them. I never ever imagined I could make “Gizzard Pilau”, but now a seed has been planted. I am secretly planning and plotting how I’ll make some “Gizzard Pilau” after trying the risotto first. Talk about “it” what a clever way of hiding them, except I’m highly suspicious, as this “It” may well be the current story teller. Who knows? One of the reasons why I make rice is because I’m on the lazy side and I love that a point reaches when I just add stock and then sit on an easy chair and wait for the rice to cook, by itself. Thirty minutes later, I ask someone else to fluff it and put it on the table. As I have never made risotto why can’t we just add all the stock at once and call it a day? why must we coax and wait on it for twenty minutes? This is very interesting but if you assure me that the end results will be worth all the coaxing and waiting then I can wait for an hour if required. I see a lot of chicken gizzard in my local store, every time I buy chicken and I have a triangle of Pecorino Romano in my fridge right now. Verdict: I am going to make risotto for the first time ever and I shall give you a feedback in form of a photo. Thanks for sharing, John, and have a wonderful weekend! What a great story. It’s tough, but I’m glad “It” finally learnt the truth! Now that’s a vote of confidence. I hope you did make it and enjoyed it. Your story gave me a belly full of laughs!!!! I love gizzards, so this would be a win for me, but I cannot imagine what ‘It’ thought about it 3 decades later. And you are right, those days ‘or else’ held more authority than all the time outs put together. Thank you for sharing this fantastic story. In case you didn’t know, one way to a southern girl’s heart is to start talking chicken gizzards and hearts. 🙂 One can find fried chicken gizzards frying up in my kitchen every once in a while. I have never put them in risotto however, but I’m intrigued. I would definitely be one that would love this risotto! Thanks for this family jewel! I had no idea that the way to a Southern girl’s heart was with gizzards. I learn so much through blogging. 🙂 If you enjoy gizzards, MJ, this risotto is for you! It really was a hit, back in the day, with many people. It’s just not a common way to prepare risotto. I love risotto and it’s a dish that doesn’t happen nearly enough round here. Thank you. I get risotto every time I visit home but don’t make it nearly enough for myself. That corn relish is good with fresh corn, of course, but it’s surprisingly good with frozen corn, too. Isn’t that funny that the whole family kept the secret for such a long time. Perhaps it’s because you never wanted the recipe changed! It sounds so flavorful. I haven’t cooked with the innards for a long time but I’ll get on it! Thank you so much, Stefano. Welcome, Raymund! This is a great recipe for risotto. It’s served my family well over the years. Thanks for the visit and for taking the time to comment. I am such a wimp when it comes to chicken gizzards, or any type of animal sweetbread! I struggle to get over my psychological reaction and just appreciate the flavour. This risotto looks beautiful, and I love the story that goes with it. My mother used to make steak and kidney pie when I was a child and I whinged and moaned for hours (or what seemed like hours… it was probably minutes, in child time!) until she’d allow me to leave the kidneys behind. I’m sure she snuck them into plenty of things she made though. Like she did with mushrooms and aubergine, both of which I now love! Thanks for sharing this precious family recipe with us John. I feel rather privileged, as I do whenever I read your posts. Such gems. Thanks my friend. You’re not alone disliking organ meats. I have my own list of things I won’t eat. It’s just the way it is. Have a great week, Laura. My kids also refuse to eat gizzards, and livers. Silly, right? They don’t know what they’re missing! Kids! To this day, “It” won’t eat gizzards. Such a shame for “It” — but a bonanza for me! Bonjourno John, Your risotto is creamy and dreamy! I bet with using the chicken gizzards and hearts it is very rich! I have never tried anything like it. Beautiful dish! This Bertolini family risotto is perfect! Believe an Italian gourmet. And it’s true: saffron is used only in Risotto alla Milanese. Thank you for the nice compliment. This risotto is my family’s favorite and I’m glad you like the recipe. I was in “Little Italy” on Wednesday night…meaning I finally made my very first risotto (with gizzards and mushrooms of course) and it was awesome. My children loved it so much. Last night my son was scrapping through the left overs…I’m afraid very little was left over (about a cupful)! Wednesday was a lousy day for photography so my photos are not so great but I hope I’ll get some time to post and give everyone a peak of the Bartolini family risotto. Thanks so much John, for this wonderful recipe. I had not eaten gizzards for a while (one pound cost only $2.40, and it included a few chicken hearts too) but I’ll certainly be eating more gizzard because we shall be making the risotto on a regular basis. I wish you a wonderful weekend and a happy blogging, Hugs to Max! This makes me happy, Liz. It’s always an honor when someone tries one of our family recipes and a real thrill when it is well-liked. When I started this blog, I wanted to record our family recipes with the hope that they wouldn’t be “lost.” Whether they’re prepared by a Bartolini or a Bartolini blogging friend makes no difference. The recipes are being used and enjoyed. It’s a great feeling. Thank you. I am sad to admit that I have never made a risotto. This looks amazing – I am tempted to embark on a risotto adventure. I grew up eating LOTS of fried chicken livers with sautéed onions, so this dish particularly appeals to me. Of course, I am a sucker for any scrumptious, aged Italian cheese on top of a velvety bowl of pasta… so this looks like the ticket to a happy tummy. Well done – and thank you for sharing your food and food memories with us. Oh, on an off note, my mother’s side of the family all live in Cincinnati and have for many, many years. Abba and I lived in Cleveland for four years, as well. Take good care! Hello, Shana, and thanks for checking this family jewel. You know the worst part or making risotto? Getting past the first attempt. It’s an intimidating dish when it really shouldn’t be and considering your skills in the kitchen, you should have little problem. Now, I’m not going to say that I made it perfectly on my first attempt but it certainly wasn’t inedible and I learned. It really is much easier than you think and it’s a great dish to have in your repertoire. I think next week will be the week I try risotto. 🙂 At worst, it will still be edible on my first try. I am not too picky. 😉 Thank you for the encouragement. Yes, it is a very small world, indeed! Take good care – and enjoy your weekend, too!